Nikola Tesla, writing about Mark Twain. Mark Twain had a keen interest in technology and visited Tesla at his lab after the two became friends. Clemens (Twain) was one of America’s most celebrated writers and no stranger to controversy. He was outspoken and critical of fellow writers. He commented on political and social issues such as race, imperialism, trade unions and feminism. 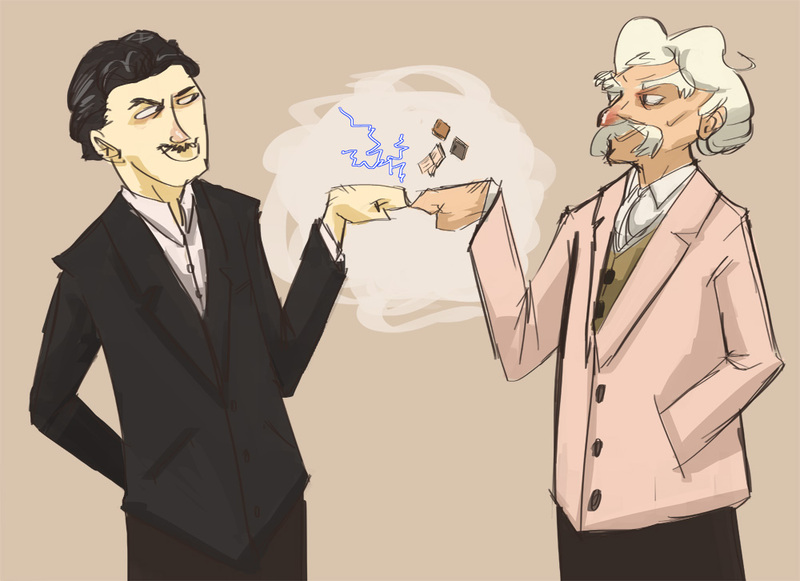 The friendship of Tesla and Clemens was established at a time when professional categories were more fluid. The line between scientist and entrepreneur was hard to draw. Interesting the wider public in your research was still an important component of developing a career. Tesla saw nothing odd about inviting friends into his laboratory to view experiments. Nikola Tesla also cured Twain, just as Twain’s writing had cheered up Tesla. It was a more physical intervention. Twain had constipation and Tesla invited him to step up onto a ‘mechanical oscillator’. “Yet another excitement awaited Tesla’s visitors at the laboratory. Tesla had been perfecting a mechanical oscillator, a sort of engine that would produce alternating current of a high frequency. The inventor had noticed an interesting effect of the machine: it produced significant vibrations. Tesla wondered if these vibrations might have therapeutic or health benefits, and one day when Mark Twain was at his lab the author asked if he might experience these vibrations himself.